Are you ready for tail-twitching lively high-spirited fun? 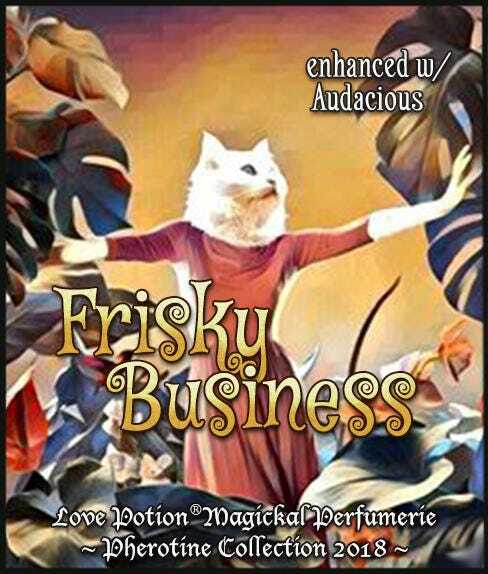 Then give yourself a slather of our fruity-herbal melange containing ingredients to promote all manner of positive emotions and get ready for some playful pouncing! Crisp red apple crowned with lovely red rose and juicy pineapple, with uplifting herbal accents of rosemary and sage layered on a base of smooth sensual myrrh. We’ve enhanced this beauty with our exclusive AUDACIOUS pheromone mix - Girl Power, baby! This Alpha-Sexual-Social mix for women encourages boldness and perhaps a walk on the wild side! Confidence boosting, friendliness, femininity, mood elevating and sexuality. An excellent club or party mix, or for encouraging a night of abandon. Let the good times roll! Scent: Attractive and fresh, fruity-herbal starring apple and sage. PINEAPPLE ~ Draws money and luck; protection. ROSEMARY ~ Intellectual stimulation, purification, love, sensuality, wards against dark forces, invigorating.